Simplify clients complex financial lives and positively influence their financial outcomes. 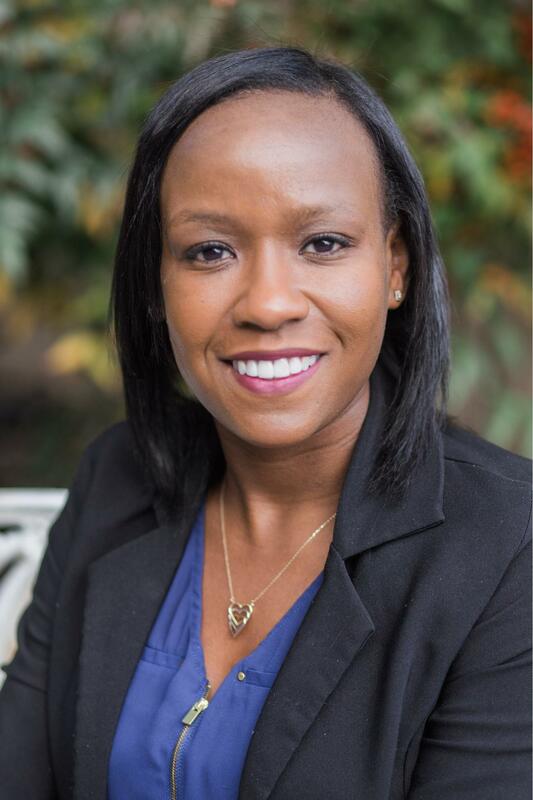 Kimberly James is a Clearwater-based wealth advisor serving a select number of individuals, families and privately-held companies & their senior executives. Her mission is to simplify her client’s complex financial lives and positively influence their financial outcomes. Her commitment to this mission is demonstrated through her adherence to Morgan Stanley’s core values: Doing the Right Thing, Putting Clients First, Leading with Exceptional Ideas and Giving Back. Kimberly leverages her decade of insurance, risk management and financial experience in conjunction with the world-class resources available across Morgan Stanley to provide exceptional products and services for her clients. In addition, a large part of her passion involves serving women investors. Her desire is to engage women in a way that resonates with them and provides the freedom they need to be impassioned, educated and intentional about their finances. 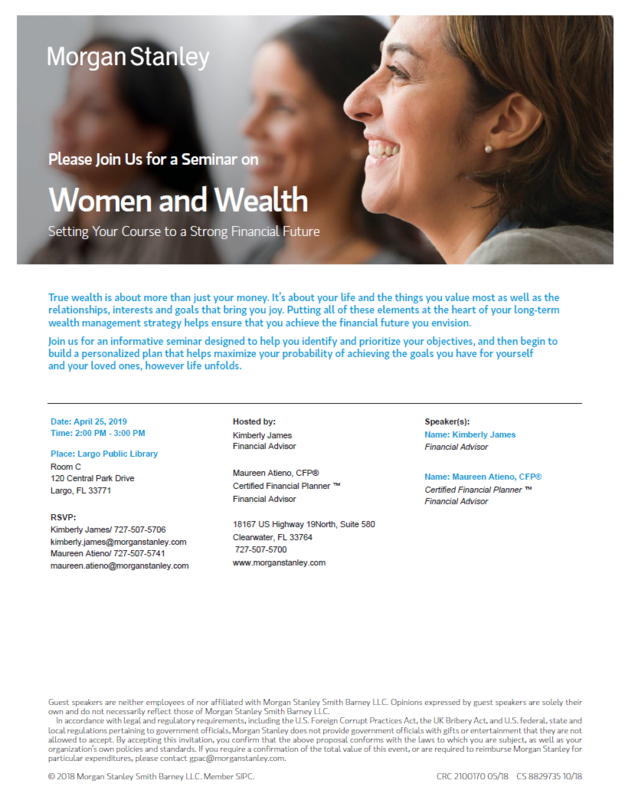 In an ongoing effort to continue educating women on financial stewardship she hosts several events that are educational, engaging and fun, while introducing women to Morgan Stanley' women and wealth series. As a financial advisor, Kimberly‘s main goal is to help clients make well-informed decisions on what types of investments are right for them. She believes the best foundation for establishing a strong relationship with each client is by 1) getting to know them, 2) gaining an understanding of their goals, and 3) using that information to create a roadmap that will help them to achieve the outcomes they envision. She also emphasizes the need to adjust investment plans as client’s goals and needs change. Kimberly’s office is located in Clearwater where she lives with her husband of 8 years, Leon, and their daughter, Mercy, who is currently in Kindergarten. Kimberly and her family attend CityLife Church in Tampa, where she also serves on the broadcast media team. They are members of and support the local Clearwater YMCA. Kimberly is also a self-proclaimed foodie, avid movie watcher and loves long-distance running. Kimberly is currently extending her services to new clients and looks forward to being your trusted advisor and experienced resource as you build a secure financial foundation. 1)	Discovery: During this first step we’ll talk about the lifestyle you enjoy, your passions and your concerns. Our conversation will also explore personal values, key relationships, details about your current investment portfolio, as well as identifying the other professional advisors with whom you currently work. 2)	Analysis & Recommendation: During this step we provide you with feedback on our assessment of your personal and financial information. In addition, we’ll present appropriate options that are designed to work together to help grow your portfolio and achieve your financial goals. 3)	Strategy Implementation: After you’ve approved your wealth plan, we will move forward with implementation of the various elements and the establishment of a proactive and personalized ‘Customer Relationship Plan’ based on the “Platinum Rule” - treating others the way they want to be treated. 4)	Post Implementation Check-in: We will follow-up with you within the first 60 days to address any thoughts, concerns or questions in relation to your customized wealth strategy. Please join us for our upcoming seminars and workshops that are relevant and timely with a focus on topics that are important to you, your family and your business. True wealth is about more than just your money. It's about your life and the things you value most as well as the relationships, interests and goals that bring you joy. Putting all of these elements at the heart of your long-term wealth management strategy helps ensure that you achieve the financial future you envision.